I used the digital leaf stamp (erased the oval shape around it) and stamped them right on top of my 8.5 x 11 photo in Photoshop Elements before printing it out. I turned the “first day” chipboard into a tag for the title (love how it turned out! ), and printed my journaling onto another tag. It’s been a while since I’ve made a full page photo layout, and it was a fun one to pull together! After working with the 6×8 format for the summer, I’m actually really excited to be going back to 9×12 to document our fall in Project Life. 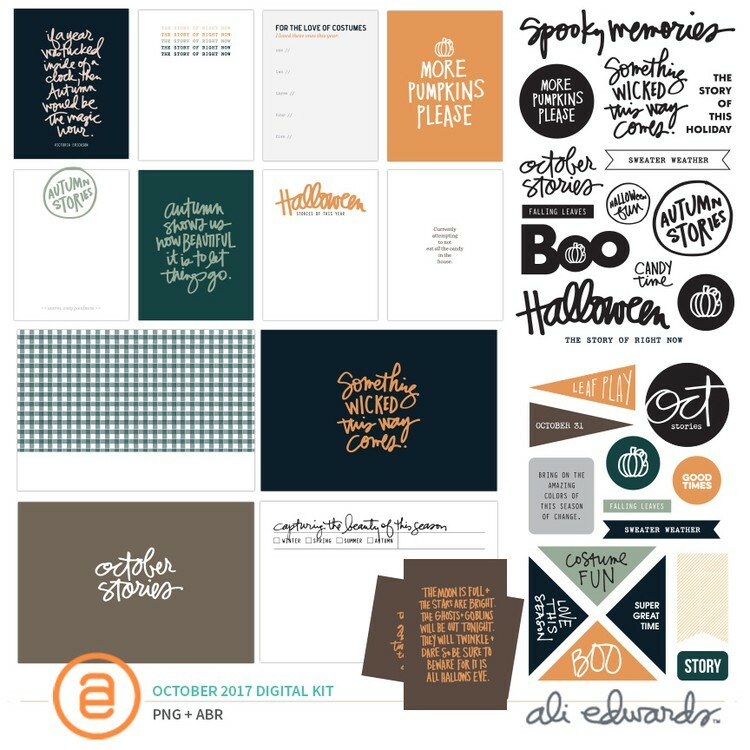 Starting September off with journaling cards and stamps from the September digital kit. There’s a new burger place in town that’s AMAZING!! Emily got to try her first Ice Cream Float. Needless to say, that was a HUGE winner. They even have Popcorn with bacon and parmesan cheese as an appetizer. I made the “Labor Day Weekend” card from a chipboard piece in the digital kit. And added some actual chipboard from the summer release to the photo of my little lady. Still getting lots and lots of use out of that set. Consume soup from our favourite Chinese food restaurant and the smell of lumber at the hardware store = two of my favourite things. I changed the colours in the “love this” journaling card by picking out a shade of blue from my husband’s hat from one of the photos above. I like doing that from time to time to make the page look just a little more cohesive. I have a confession. When Day in the Life rolls around, I’m pretty good at getting lots of photos, sort of okay and making lots of notes, and TERRIBLE at actually getting the project completed, on paper, into an album. THIS IS NOT A DIFFICULT THING TO DO!! But when it comes to pulling a project like this together, I’m totally guilty of overthinking how I’m going to do it, to the point where nothing actually gets done. Not this time. Ta da!! The documentation structure. This was the first of 3 “Day in the Life” projects hosted by Ali Edwards, that are planned to occur this year. Each time it’s scheduled, there’s a kit available (digital and physical version, not required but always awesome!!) to go along with it that usually helps focus on a new technique for how to capture your day. This first one was based on time. The idea was that each hour, you would take a photo and write just one related story. I was happy to take the suggestion of setting an alarm on my phone each hour to remind me to do it. This structure made it easy, and I really enjoyed following along! 2. Bringing it together. This is the part that I usually get stuck. The DITL kit (both the digital and physical format) included 3×4 cards with colourful numbers in the upper left hand corner and lots of white space to write your story. Lots of people simply used them to fill in the pockets of a divided page protector alongside their photos. As easy and beautiful as that was, I’m not really in love with the 12×12 size at the moment. I played around with 9×12 formats but I just wasn’t feeling it. And the idea of “designing” a layout seemed like a loooot of work in that moment. Here was my “aha’ moment. I took a look back at the templates from this year’s Week in the Life collection and found one that I thought might work really well. I used the 8.5x 11 version and played around with different orientations for it in PSE. I then decided that I’d punch the times from the journaling cards into circles and use them in place of the existing word art elements that were included with the template. There was plenty of white space in the design to fit in my journaling. Once I started laying it out, I knew it was going to work and I was really excited to get it done!! The final product is 3-8.5 x 11 pages that capture one day in our (my) life. June came and went in the blink of an eye. We celebrated the last day of school today (yay!!) and I am really looking forward to the change of pace for the next 2 months. When summer arrives, it’s a lot harder to convince myself that I “want” to be in my basement at my scrapbook table. It’s not the act of scrapbooking that I’m not a fan of, it’s the location. I’d so much rather be outside in the sunshine, enjoying the breeze, drinking a slurpee and watching my kids play. Knowing this is true (it happens every year), I changed my approach to memory keeping last summer. I downsized to a 6×8 album and created a bucket list of summer things we (I) wanted to do. My storytelling centred around checking those things off the list. I still wound up with a really good mix of everyday life stuff thrown in there. It worked so well, I plan to repeat that same formula this summer. On the back of the transparency, I created a little card with our (my) “summer bucket list” of to-do’s. I created the journaling card in the upper right pocket by repeating a digital stamp (“find your summer joy”) across a 3×4 canvas and added one of the digital chipboard elements with a foam dot (“hello summer”). These elements as well as the banner across that wood veneer camera are all from the June Digital kit. The camera itself was from a past Story Kit (“Click”). I used the other half on a layout 2 years ago and couldn’t bring myself to part with the rest of it. I’m so glad I kept it! This is probably my current favourite photo of Emily. She was goofing around on the back of Brett’s chair while we were at Liam’s soccer practice one evening and I grabbed my phone to snap a quick pic. When I got home later that night, I took a look at the June Digital Kit and the quote card felt like it was meant to be!!! I extracted the handwritten text from the digital card and added it right on top of my photo and I just loooooove it. I’m considering blowing this one up for somewhere in my house. But for now, it’s printed 6×8 and has a home in our summer album. One of the things I love most about the 6×8 size is that it doesn’t feel quite as intimidating to experiment a bit with different mediums. I love the look of layers in my little albums, with transparencies and vellum and see through pockets. I used another one of the digital stamps to create the pink patterned background and printed it on vellum. I’m not entirely sure how I’ll incorporate it into my album yet. I may add it to a custom sized page protector, or I might just punch holes in the edge and include it as is. My plan for the rest of the album is to make good use of the upcoming digital kits and shop my stash (which is in need of purging right about now). I’m looking forward to sharing my progress throughout the summer! One last quick share before I sign off for today. I’m pretty sure we’re one of the last regions to finish up the school year, but in case you need some quick teacher thank you’s, I whipped up these adorable photo tags with a digital stamp (again with the June Digital Kit) and a photo, printed on matte photo paper and cut into the shape of a tag. They add a sweet little personal touch for the super special people who help us make it through the year. Always thankful for our village. I seriously can’t believe it’s the end of May. This was a very full month in our house and it made the time fly. Here are the stories I told with Ali Edwards’ May digital kit. The May kit is filled with lots of awesome sentiments for themes about mamas and friendships and girl-time and self care. So many story prompts, which is always a welcome creative kick-start. My first project was absolutely inspired by the Mother’s day journaling cards. I don’t think I’ve ever made a page about my mom before and it felt so great to get these words down on paper! I had fun looking back at photos of the two of us together to include in this layout, and I realized that it’s been a long time since we took a picture together. So we fixed that situation 🙂 The design inspiration came from a sketch included in week 2 of Studio Calico’s Summer of Sketches class. (I’ll be contributing a layout to the class later next month). We celebrated Emily’s 4th birthday this month, and it was completely magical! I’ve got LOTS of photos from her party, but truthfully, I’m not sure when I’m going to get a chance to pull them together into a project. So for now, I’ve got my favourite photo from her big day and the story written down. If I never get anything else done to scrapbook her birthday this year, I can honestly say I’m satisfied with this as “enough”. I used a digital stamp from the May digital kit and recoloured one of the journaling cards to bring this layout together. This was a really fun one to work on! The design here was inspired by a layout that popped up in my Pinterest feed by Tina Aszmus (aka. Life.Love.Paper). The Story Kit theme this month is “Brave” (which will be available until the 12th of June). There’s a long story here about how I found this theme to be a real challenge, how I really took Ali’s words from the main presentation about taking this opportunity to tell a hard story to heart, and ultimately the realization that being brave happens in the everyday moments of real life. I’m having a hard time believing that April is just one week away. Seriously. March has flown by, so I thought I’d share a few of the projects I made this month for Ali Edwards’ Creative Team. March is a big birthday month for us! Liam and Brett’s birthdays are just 4 days apart. I haven’t made a page yet about Liam’s birthday (which was awesome and crazy and busy), but I did jot a few things about how we celebrated Brett’s big day this year. This hybrid 8.5 x 11 layout came together with the March digital kit. I enlarged the “march stories” digital stamp (definitely one of my favourite pieces from the collection) to make the background here. Right after birthdays, March break started. We wound up with the first big snow fall of the whole winter and I was so excited to take the kids sledding! This is a 2 page 6×8 hybrid layout, inspired in part by this awesome design I came across on Pinterest. Super simple but pretty much perfect. I enlarged this 3×4 card from the March Digital kit to 4×6 and attached it to the oversized 12×8 photo with a few pieces of washi tape. This month’s Story Kit theme is Eat! And it totally stumped me at first. (crazy right) There’s got to be a million stories that relate to this topic, but it took me a while to realize that the one I wanted to tell most was this little snapshot about what dinner time looks like these days. It’s not at all glamorous. In fact, just the other day the words “no more fart noises at the table unless they’re coming from your but” were spoken. For real. I used the digital plastic circles, the title from one of the journaling cards, and you might be able to very faintly spot the story notepad in the background of the journaling page to create this 2 page 8.5×11 layout. And those little utensils are my FAVOURITE!! In the physical kit, they’re wood veneer pieces, but you can print/cut any colour you like from the digital elements. As stressful as dinner time feels most days, I’m truly thankful for the time we get to spend together. And now I’ve got LOTS more story ideas for this theme. Looking forward to working on those in the coming weeks. Another week in the books! This week’s spread came together with the February Digital Kit by Ali Edwards. The digital kits are something new for this year! A collection of journaling cards, stamps and chipboard elements all in exclusively digital format will be released each month, often with a seasonal theme. With Valentine’s Day in February, it was no surprise that this month’s theme is all about “love”. This is definitely a theme I can incorporate into my projects all year long. Going back to that idea that “memory keeping is a way to make love visible”. This spread covers a few of the highlights from February 6th-12th. I’ve been using the digital chipboard pieces by printing them out onto matte photo paper and cutting them out with scissors or shape punches. I changed the text on that heart in the upper left corner to just say “monday.” and stapled it onto my photo. Emily is so ready for spring!! My mom asked if I could find a few photos for her from when she and my dad were dating and first married to go into a frame she recently purchased. Liam took a look at them and said “why do you have a picture of Terry Fox?” when he saw my dad, lol! That pic from their wedding in the bottom left…love having that in here. I made a few cards myself with the digital kit. This “love” card is actually a 3×4 canvas, a pattern from one of the 4×6 cards, and a digital stamp all merged together to make something new. I worked with the colours in this month’s kit and used them to re-colour some of the journaling cards and elements to make a more cohesive spread in combination with my photos. There’s also a quote card included in this month’s kit that is so perfect for this week. I didn’t even realize how fitting it was until I was putting this spread together. It says “When I get to the end of my life and I ask one final “what have I done?”, let my answer be: “I have done LOVE.” I’ve been trying to be more intentional about how I spend time with my kids this month. (My daily practice for OLW was to try to spend at least 20 minutes everyday playing with them, without the distraction of my phone or my to-do list. Just spending time WITH them. I haven’t been successful every day, but the days I do feel a whole lot better.) So there was that connection. And then a crazy Friday at work had me starting at 8:30 am and not getting home until 4 am the next morning!! Very very not the norm, hence the full moon reference. But again, the quote stuck with me because as nurses, we make sacrifices for others to do what is right and to show love for people, to provide care and support, even when we don’t know them. One more customized journaling card, recoloured and literally a white space added to include some journaling. And that wraps up week 6! I probably say it every week, but I love how this one turned out 🙂 Thanks so much for stopping by today! I love our stories. I really really do. And that’s why I love this scrapbooking hobby so much!! Because I get to preserve and remember both the little ones and the big ones. This month, I’ve been working with Ali Edwards’ February Digital Kit. And somehow, pieces of the universe have aligned to make me see all the little love stories going on around me. A big one these days (one that is not new, but not always present either) is the love story between Liam and Emily in their big brother/little sister relationship. Knowing what story to tell for this one was so easy, but deciding on a design… lets just say that today I’m sharing 3 versions of the same layout. A really important part of this story was the photos that go along with it. Liam and Emily were deeply into a pretend scenario of being doctors and getting ready for “doctor school”. I asked them to stand against the wall so I could take a photo of them for their ID badges, because clearly ALL doctors have to have an ID badge 😉 They were more than happy to agree and stood side by side as I snapped a few photos with my phone. It was on the 5th snap that Emily leaned over to Liam and whispered “I love you”. And the pictures that followed, that’s what love looks like!! His face transforms with a giant smile and even Emily lights up. A perfect little moment and a super lucky capture. 12×12 As I was struggling with the 8.5×11 design, I spotted the film grid from a previous Studio Calico kit on my desk and thought “ooooh, this might work!”. I already had the photos and numbers printed from a previous attempt, and it turned out the fit pretty much perfectly! I reworked the title and journaling to fit down the right side of the grid and mounted all the pieces onto a 12×12 sheet of cardstock. I liked it…but it didn’t really feel like a great way to show off the kit elements because there was just that one digital stamp there. I moved on to a third attempt with a different size, but went back and added a few more of the heart circles. I have to say, that extra little pop of hearts really does help. **Note: None of the links in this post are affiliate links, just here for your reference if you’d like to check them out!